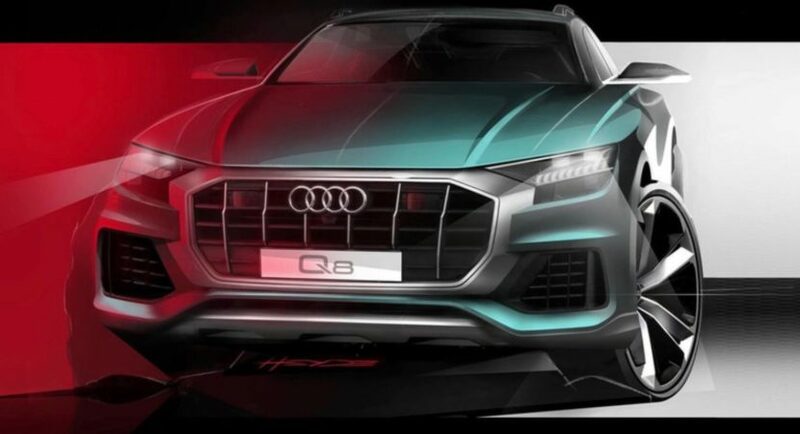 Audi started campaigning its latest creation, the new Q8, a couple of months ago and will keep doing that until the 5th of June when the imposing SUV is going to be unveiled. With whistles and bells, the German based carmaker has recently released a new teaser video which reveals the car`s aggressive front end. Part of the new campaign called #Q8Unleashed and starring famous actor Tom Hardy, the video below is giving us a closer look at the SUV`s new front end, which quite resembles that of the Q8 Sport concept. The direct rival of the likes of the new Mercedes-Benz GLE Coupe or BMW X6, the new Q8 from Audi is definitely going to kick some asses with an extremely evolutionary design and high-class interior. Following a previous teaser revealing the rear end, the new video highlights the car`s front, which now comes with a massive front fascia with sharp and wide Audi grille with vertical slats, slender LED headlights, raked windscreen, slim door mirrors or large corner clusters. Besides the new design language, the new Audi Q8 will also be state-of-the-art in terms of technology, featuring the latest upgrades and safety features. Not to mention the plethora of leather upholstery and other high-end materials. Built atop the company`s new MLB Evo architecture, also underpinning other models within the Group (Volkswagen Touareg, Lamborghini Urus, Bentley Bentayga), the new Audi Q8 will features a wide range of engines with four- and six-cylinder configurations. From what we know so far, the most powerful engines refer to a 2.0-liter mill with 250 horsepower as well as a V6 version with 355 horsepower. However, word also has it that the model will also feature a PHEV variant, along with 530 horsepower. Until its official launch in a week, let`s take a closer look at the car`s new front end! How do you find it? Is it a worthy competitor for the brutal BMW X6? Porsche may be sketching a new 928?